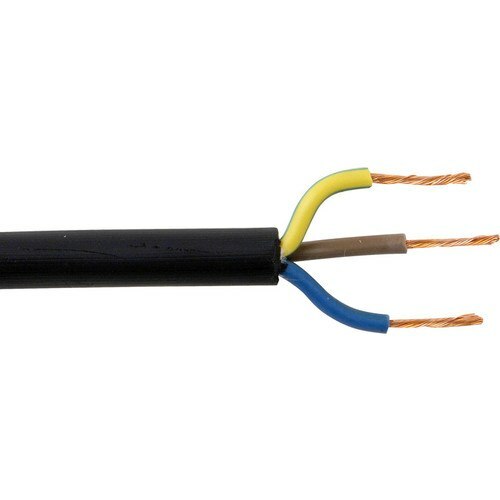 6 Amp Brown, Blue & Earth H05RR-F Flexible Circular Wire for Harsh uses such as repairing Tools such as Drills, Kangos, Grinders and Small Appliances such as Radios. More Durable than PVC and suitable for enviroments such as workshops. I recently purchased an electric trolley fOr installation in my shop. Unfortunately the manufacturer did not offer a longer controller cable, other than the standard 6 foot one. Checking the cable code revealed it was not readiblly available in America. After an extensive Internet search I discovered this website, wher i could get it at a reasonable price and at a practicable length, 10 meters. The shipping I chose was the standard Royal International Mail, which toy took one day longer than estimated. The cable is now installed and the trolley is working great, 22 feet in the overhead.